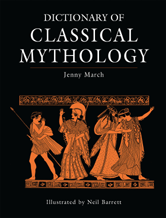 Jenny Marchâs acclaimed Dictionary of Classical Mythology, first published in 1998 but long out of print, has been extensively revised and expanded including a completely new set of beautiful line-drawing illustrations for this Oxbow edition. It is a comprehensive A -- Z guide to Greek and Roman mythology. All major myths, legends and fables are here, including gods and goddesses, heroes and villains, dangerous women, legendary creatures and monsters.